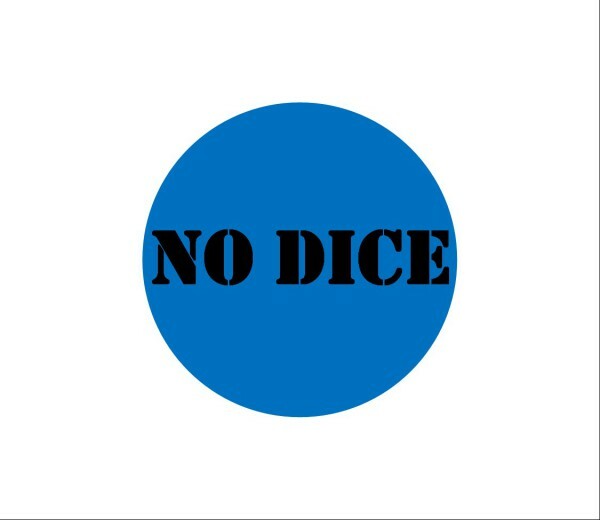 How many players can you have in a game of No Dice? There are 60 cards, so with a hand of seven you should be able to play with eight players, but that leaves only 4 in the stock deck. This skews the scoring somewhat, and once the stock deck is gone you can’t play PASS or SWITCH without “losing” a turn. Purists aren’t going to like that. I’m not sure I do either. Practically, the game should work for 2-6 players, and if you’re not too worried about balance of play then 7 should be fine. You could shuffle two decks together, but having two of every card would mean instant double points for anyone playing a card onto it’s duplicate without introducing much challenge to the game. How many cards do you play in each turn? One. Unless it’s an action card. If you’re playing any action card except the double points card, you may play two cards that turn. Action card first then your scoring turn. If you play PASS when it isn’t your turn, you still pick up there and then but play as normal when it is your turn. I backed you on Kickstarter. Where’s my stuff? Local backers have their decks, and the T-shirts are due shortly. If you ordered a T-shirt and have not yet received your deck, both will arrive in one parcel as soon as the T-shirts reach us. UK backers will be getting decks by post shortly but we’ve had to improvise a postage solution. International parcels have shipped. If you’re expecting a Postcard, they’ll be with you shortly. What’s this packaging lark then? Due to cost constraints, an original and somewhat innovative post packaging solution was probably in order. Your decks should arrive protected and in good order. If that doesn’t happen, please let me know. The game box itself is “second choice” from an alternative supplier but it’s turned out rather well. QUOD is a similar game to No Dice, but much simpler to play. It’s something I dreamed up while working out how to provide a loot mechanic for a pirate game I’m working on. No, really. It’s Print and Play, in that you can download the necessary files to make your own set. After being stung with a VAT invoice for importing decks from China I’m not in the mood to commit to another Kickstarter just yet. Help yourself!